Stupid hurricanes in the Gulf. We didn't get any major problems, but the pressure in the air has given me a headache I just can't get rid of. :o( So instead of making Faith a cute & innovative lunch, I had to rely on leftovers. 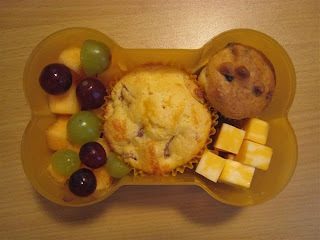 She had one of the corndog muffins, a blueberry muffin, cheese cubes, and grapes & canteloupe. It looks OK, but I was thinking of making her quesadillas instead.